It’s high noon on 17th June, and to match the economic climate of 2011 it’s a bit overcast and the forecast isn’t too great. Fitz is standing outside the Hale clubhouse with fingers crossed for the weather. Inside, Maccie is perfecting the customary home-made steakburger and sausage bap lunch (with token healthy salad to save our consciences). Despite careful preparations, there had been some late team changes and cancellations. The pre-prepared team cards would need serious updating as the day got under way. Yes, numbers were down a little, but that meant everybody had a better chance in the competitions of walking away with a prize. It was all there to play for. The ever-resourceful Fitz adjusted the running order to accommodate latecomers and several incomplete teams. Brian Coghlan (last years Trophy winner) arrived slightly late to join his team-mates (Team 9), and pretended to have accidentally left the St Ambrose Golfing Society Claret Jug trophy in his car. “Oh I must have forgotten it – I’ll just go back and bring it in” He returned shortly, wielding the coveted trophy in triumph, pointing out his newly engraved name. Gamesmanship is clearly alive and well in the St Ambrose Golf Society. After repeated attempts Team 3 finally located Johnny McLoughlin, who had for some reason gone to the gym by mistake. He finally made it to Hale but Paul Fleming and Dave Pugh didn’t. Neither did the whole of Team 6 (that Mark Gallimore again!). Yes it was gloriously chaotic – naturally – but everything sort of fell into place. With the help of Maccie’s unmatched sustenance and Hale’s draught Banks bitter everyone progressed from greetings onto reminiscences and banter while awaiting their tee times. Noel Wright and Tony Harper’s Warrington team (team 7) were the first away. 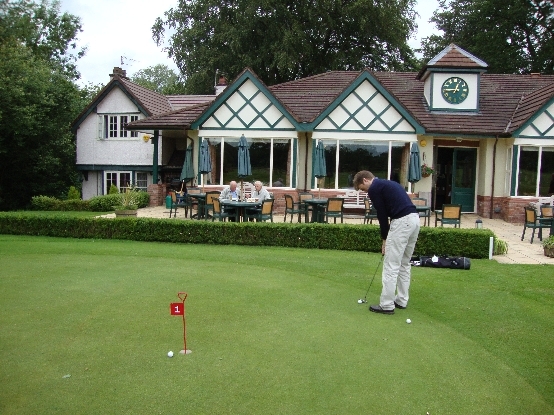 In all, we had 30 golfers in 8 teams teeing off, only 20 minutes behind schedule – a definite success. The OB’s have been blessed with some great weather in the past, having only one rainy afternoon in the past 15 years and today we were once again favoured when the forecast rain failed to materialise. Indeed, the conditions were, once again, near perfect for playing golf. Having a team on virtually every hole meant we had the course entirely to ourselves, which was perhaps, fortunate considering then the odd miss-hit here and there. It also allowed us the luxury of stopping at the 9th for a welcome pint half-way round. Following the golf we all met suited and booted in the clubhouse where we enjoyed a relaxing, well-earned, pre-dinner drink prior to dinner. The Mac’s had prepared their usual superb evening meal consisting of serrano ham and melon followed by roast beef and all the trimmings. The dinner was well attended by 32 people in all. Our Chairman, John Kennedy thanked the green-keeping staff for the fabulous condition of the course as well as the professional Richard Booth for his help and excellent prize table. Mr Kennedy also thanked the club for their use of the course and finally the caterers, Ann and Brendan MacNamara for a lovely dinner. The evening was enjoyed by all and rounded off with considerable banter when Peter Fitzpatrick announced the prizewinners, particularly as his team beat the Chairman’s team on a card play-off!